Halloween Tiles Resource Pack | Create Your Own Game! Whether you're looking for witch house decorated for a Halloween party or a spooky dwelling of the evil witch, we've got you covered! 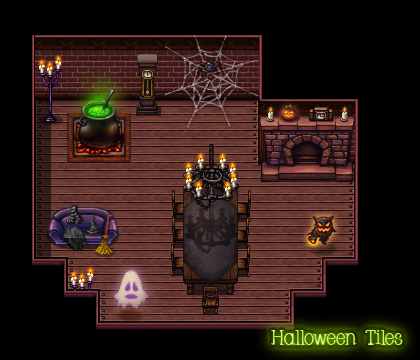 Halloween Tiles Resource pack is a collection of tiles inspired by one of our favorite holidays. 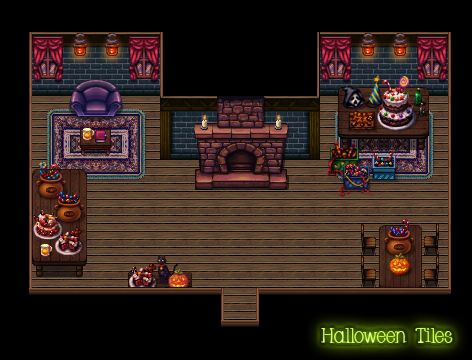 This versatile set includes a large variety of furniture you can use to map out the perfect Halloween home. From buckets and boxes of candy, glowing pumpkins and bubbling cauldrons to spider webs, ghostly apparitions and elaborate chandeliers, you're sure to find something you'll love.